Aoyama, J., Minegishi,Y., Nishida,M., Tsukamoto, K.
Of more than 800 species of eels of the order Anguilliformes, only freshwater eels (genus Anguilla with 16 species plus three subspecies) spend most of their lives in freshwater during their catadromous life cycle. Nevertheless, because their spawning areas are located offshore in the open ocean, they migrate back to their specific breeding places in the ocean, often located thousands of kilometres away. The evolutionary origin of such enigmatic behaviour, however, remains elusive because of the uncertain phylogenetic position of freshwater eels within the principally marine anguilliforms. 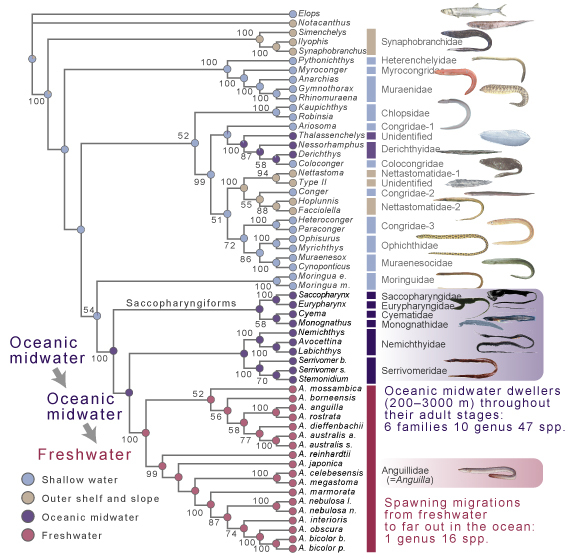 Here, we show strong evidence for a deep oceanic origin of the freshwater eels, based on the phylogenetic analysis of whole mitochondrial genome sequences from 56 species representing all of the 19 anguilliform families. The freshwater eels occupy an apical position within the anguilliforms, forming a highly supported monophyletic group with various oceanic midwater eel species. Moreover, reconstruction of the growth habitats on the resulting tree unequivocally indicates an origination of the freshwater eels from the midwater of the deep ocean. This shows significant concordance with the recent collection of mature adults of the Japanese eel in the upper midwater of the Pacific, suggesting that they have retained their evolutionary origin as a behavioural trait in their spawning areas. Inoue, J.G., Miya, M., Miller, M.J., Sado, T., Hanel, R., Hatooka, K., Aoyama, J., Minegishi, M., Nishida, M., Tsukamoto, K. 2010. Deep-ocean origin of the freshwater eels. Biology Letters, in press.